Perry Ellis: a once iconic American menswear label and former mainstay at the New York Fashion Week tents. Teetering on the verge of irrelevance, other competitors began to leave the company’s classic but indistinguishable designs behind. Duckie Brown: the fashion design duo of Steven Cox and Daniel Silver who also used to show at the tents. 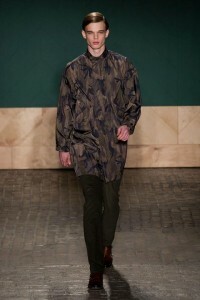 Pushing the boundaries of casual, their loud prints didn’t always resonate with the crowd, eventually moving off-site. So what could a collaboration between the two aesthetics, lying on polar opposite ends of the American menswear spectrum, offer to the public? As it turns out, a near-flawless collection – the second between the two labels – that left one spectator marveling to another that it was perfection from a commercial standpoint. Although Cox and Silver have stated in past interviews that they do not regard the partnership as a revival of the Perry Ellis brand, one cannot help but point to their simultaneous collaboration with Florsheim, which injected some much-needed oomph to the shoe label whose stores shuttered in the early 2000’s. In a wave of bomber jackets, work shirts and trousers, prints and colors for Fall/Winter 2013 that normally would have screamed along a Duckie Brown runway were toned down just enough to be considered hip for Perry Ellis. Cuts fell between tight and baggy territory, while the Florsheims provided a smart accompaniment to the military-inspired collection. 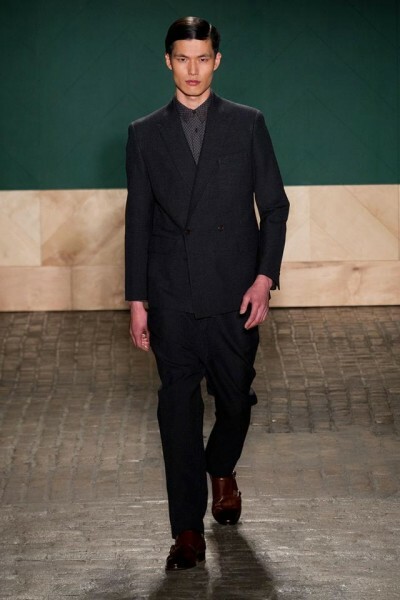 While the casual wear was more in line with the Duckie Brown signature style, the most impressive segment was near the beginning of the show with several dark grey formal suit jackets paired with equally dark formal trousers. Wearing Duckie Brown to the office? It’s now an option, thanks to Perry Ellis.